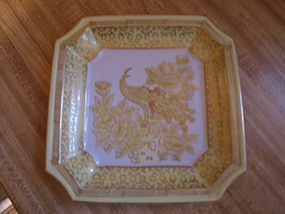 Vintage ashtray marked as Andrea Sadek 7949 Hand Painted Made in Japan. As always, when marked as Sadek, the porcelain is a very nice quality. It is white and decorated in yellow and gold. It features a peacock and flowers. It measures 8 1/8 x 8 1/8 inches. True, it is an ashtray, but due to the design, could be used as an accent piece. There is no damage. I need your zip code to calculate the postage. Larger photos available by email.